It seems to me I've been a bit of a misery this week, so, to redress the balance, I went looking for the first signs of spring. To be fair, I only went as far as the front garden, but I still found plenty. You definitely don't live in my neighborhood! There aren't that many signs of spring here, except it is warm enough that most of the snow did melt last night. Lucky you. Here we have lots of snow. But I live "close to" the North Pole, though. Gorgeous photos of a spring that is well and truly here. 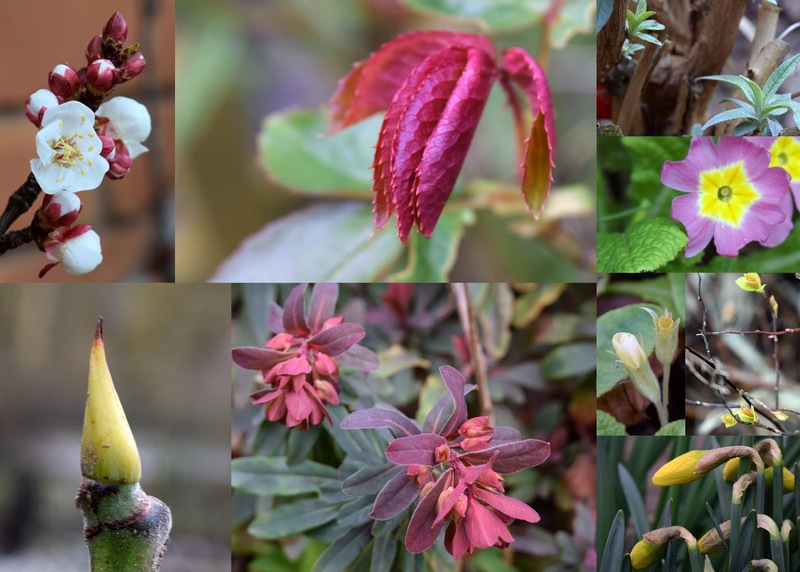 More wonderful photos of early Spring in England. Am I correct in thinking the pink bells centre bottom are pulmonary? I have some in the garden but they are a mix of blue/purple, I love these plants but mine seem to try and take over. Me again Kaja - just noticed the kind auto has changed from pulmonaria to pulmonary - I may have worked in hospitals etc but not to the extent of mis-naming plants!! Beautiful -- I found the first blooming daffodil in our yard today. Joy! Oh my god, your front garden must be wonderful. My scrubby postage stamp bit to the side of the house is getting over run with brambles, with a few daffs popping up here and there. I love gardening, but the farm has got so close after all its recent expansion I can't bare being out there (and get bitten to death by horseflies). I'm glad to see you ventured out, even if it was only to the garden. What lovely flowers! I had no idea your climate was so different from mine. I hope you're feeling lots better now. Thanks so much for linking up, Kaja! This is one of my favourite sets and I definitely don't need an excuse to revisit your Saturday photos. Hope you are feeling better.